Back in December, I was invited to drop by MyChef to try them out. I did exactly that; but I only had one dish and honestly, it's kinda hard to figure out what the food is about by trying one item. Therefore, I waited this long to do a post because I made a return visit almost a month later to try out a breakfast item on my own coin. Before I talk about the food, lemme give you some background about the place. 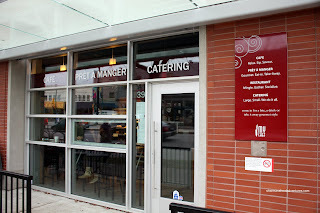 In addition to the cafe, MyChef is a catering business that uses local and organic products. 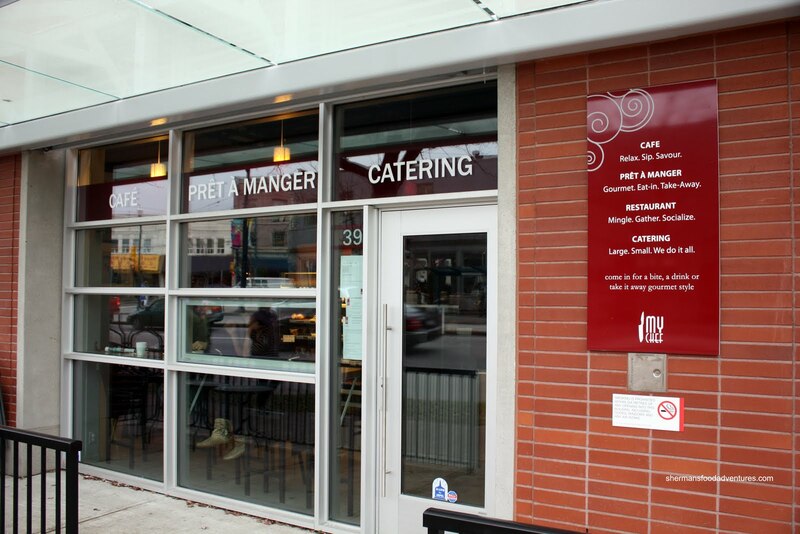 The cafe is situated within the eclectic Main Street corridor. It's cozy and family-friendly. For me, it reminds me of something you'd find in Portland. I asked the friendly employee at the counter what to have if I would only order one dish. His response was the Moroccan Chicken with rice. With a generous helping of 2 pieces of chicken, it was not as flavourful as I would've hoped. It wasn't bland per se; but with all the spices that go into a dish like this, it didn't really show up. With that being said, the dried apricots were front and centre adding another level of sweetness. 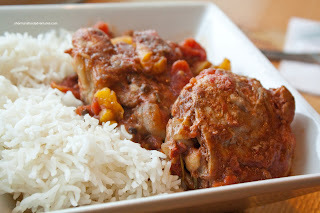 As with any braised chicken, it wasn't exactly juicy; but it was tender. The rice was chewy and slightly dry, which was the perfect accompaniment to the sauce. On a return visit, I decided to try out their breakfast. 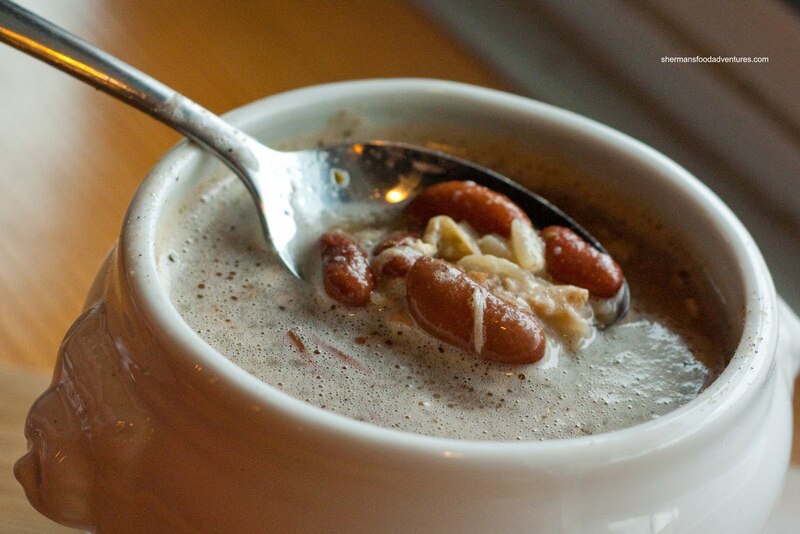 I started with a their daily soup first, which was the Chicken, Rice and Beans. For me, the soup had a "homemade" feel to it. It wasn't salty or "processed" tasting. Lots of rice, chicken and beans, it felt good for the soul. I could pick up some herby taste; yet it had a tang to it. The tang was actually pleasant; but I couldn't put my finger on it. Was it lemon? As for my breakfast, I went for the Pulled Pork Eggs Benny. Unlike the pulled pork on pancakes at Deacon's Corner, there was a definite Asian slant to this version. Rather than BBQ-sauced pork, this one had five-spice hints. At first, I wasn't sure how this would work; yet in the end it was fantastic. It went well with the perfectly poached eggs, barely cooked spinach and cubed hashbrowns. The Hollandaise was very tart with lots of lemon. I personally love it; but some might find it too strong. For me, I would definitely order this again. So I liked the Benny while being indifferent with the Moroccan Chicken. Maybe I have to come back a third time as a tie-breaker. dine out menu yesterday check it out! Peter, I love Eggs Benny and pulled pork, so the combination works for me! For me Society didn't work. Love the ambiance, style and concept. Food, not so much. As for the flash, if you don't want to use one, then get a DSLR, then buy a prime lens for quick shutter speed to take photos in dark lighting. Then post-process with Adobe Lightroom. Thanks again for coming! 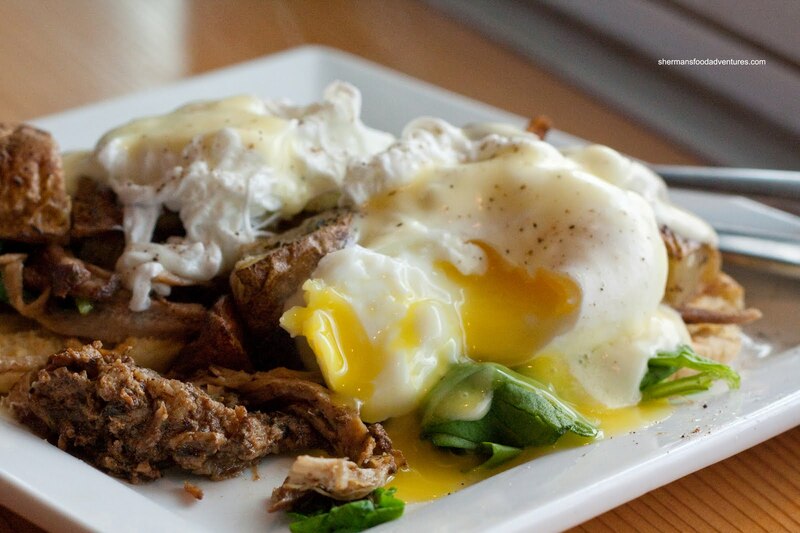 We're glad to hear that you liked the pulled pork eggs benny. Our latest customer favourites from the pret a manger fridge are the meatloaf and lamb stew. Perhaps one of these will be your tie-breaker?? Thanks again for coming. Glad to hear that you liked the pulled pork eggs benny. The latest customer favourites from out Pret a Manger Fridge are the meatloaf and lamb stew. Perhaps one of these will be your tie breaker? ?